The City of New Philadelphia has been working diligently in recent years to develop a new comprehensive Storm Water Management Plan (SWMP). The goal of the SWMP is to ensure proper maintenance of the City’s storm drainage system and the health of receiving bodies of water such as the Tuscarawas River, Oldtown Creek and Beaverdam Creek. Our aim is to uphold the standards of the Ohio Environmental Protection Agency while building a strong relationship with the community. In accordance with the City's EPA issued NPDES (National Pollutant Discharge Elimination System) permit, City officials have developed an illicit discharge detection and elimination (IDDE) program to mitigate the amount of pollutants entering our storm water collection system's receiving waterways. An illicit discharge is defined as "any direct or indirect non-storm water discharge to the City's storm drain system." Illicit discharges include, but are not limited to vehicle maintenance fluid, leaking trash cans and dumpsters, damaged sanitary sewer lines, paints and stains, silt, sediment, concrete, gravel, soaps and detergents, and other debris. These pollutants can lead to destruction of the City's storm water infrastructure, the spread of disease, the contamination of waterways and aquatic environments, and can be toxic to both aquatic and human life. 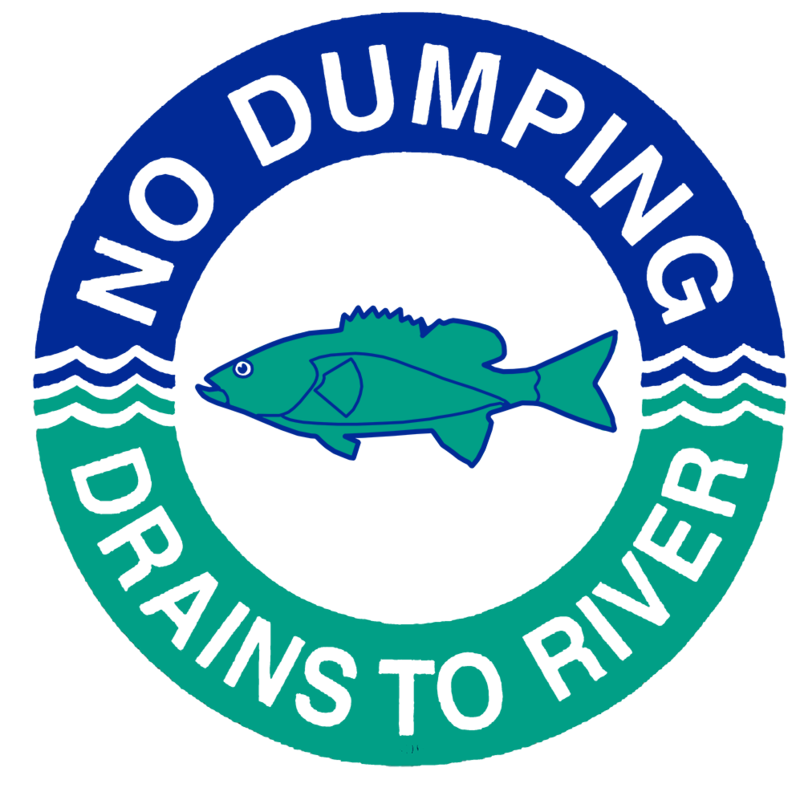 Remember, any substance that enters the storm drain system is not treated and flows directly to receiving waterways! To learn more about getting involved, please see the SWMP Community Event Calendar. The City is working to identify illicit discharges by performing annual dry-weather outfall screenings and septic system inspections. 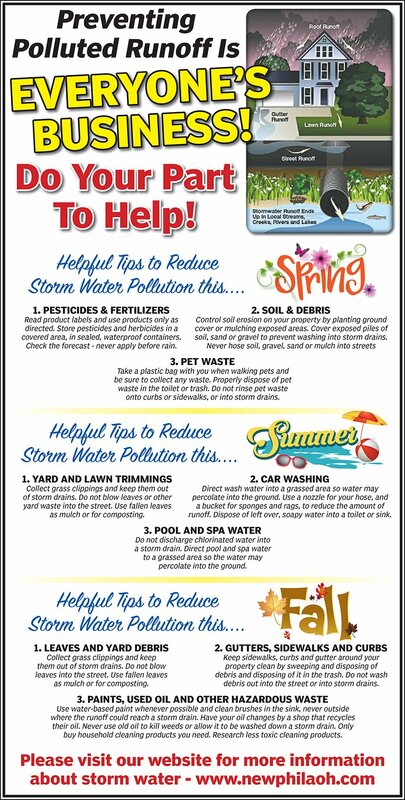 You can do your part and help the City of New Philadelphia maintain an operating storm water system and healthy waterways by reporting illicit discharges. Illicit discharges along with any other water quality concerns may be reported by calling the Water Quality Incident Report Hotline: 330-339-3573. The City of New Philadelphia is striving to promote environmental awareness in our community and build relationships among our residents. Please see the events listed below to learn more about getting involved. 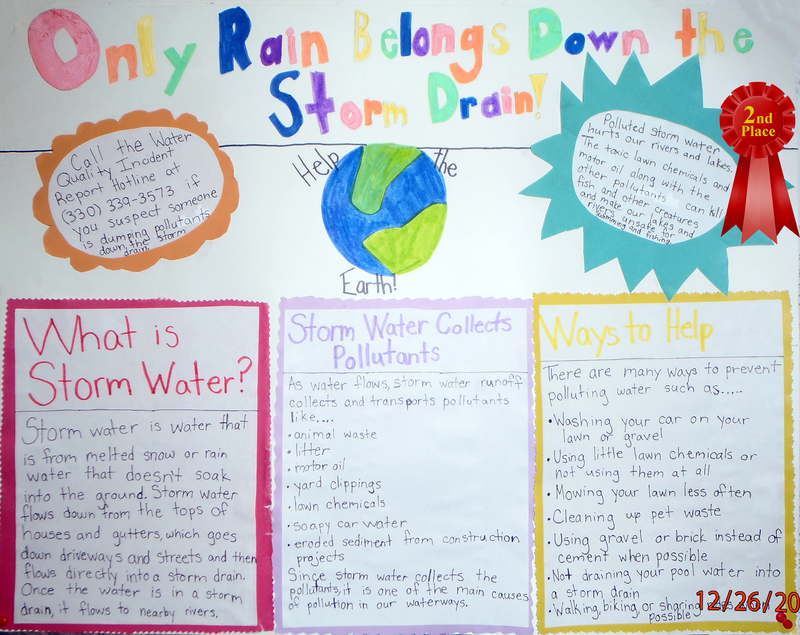 The City of New Philadelphia would like to give a big “THANK YOU” to all the 4th and 5th graders at East and West Elementary who participated in the Stormwater Pollution Control Poster Contest. All of the posters were displayed at the First Town Days Festival during the 4th of July weekend, and everyone was invited to view and vote on their favorite. There were 24 participants in this year’s contest. Congratulation to our winners and to all who participated. 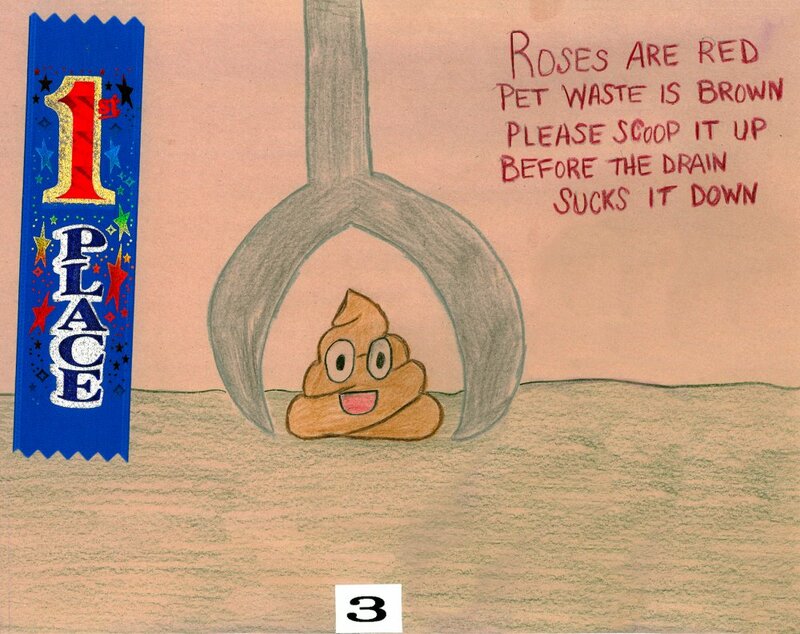 In the 4th grade division, contestant #15, Ruby Byers, a student at West Elementary, took 1st place honors. In the 5th grade division, contestant #22, Neveah Beard, a student at West Elementary, took 1st place honors. 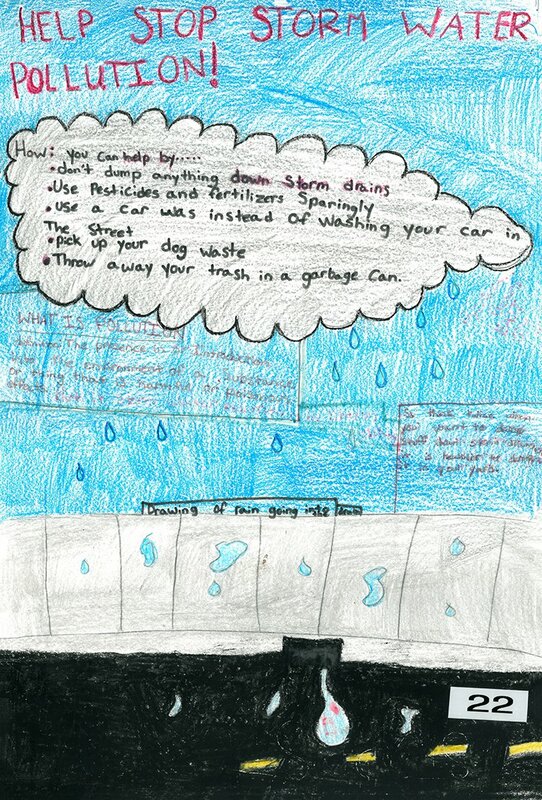 The NPSWC (New Philadelphia Storm Water Commission) and the City of New Philadelphia would like to congratulate 1st place winner Jenna Henke and 2nd place winner Mackenna Armstrong for participating in our “Storm Water Pollution Prevention Awareness Poster” competition. Both Jenna and Mackenna attend South Elementary and both are in the 5th grade. 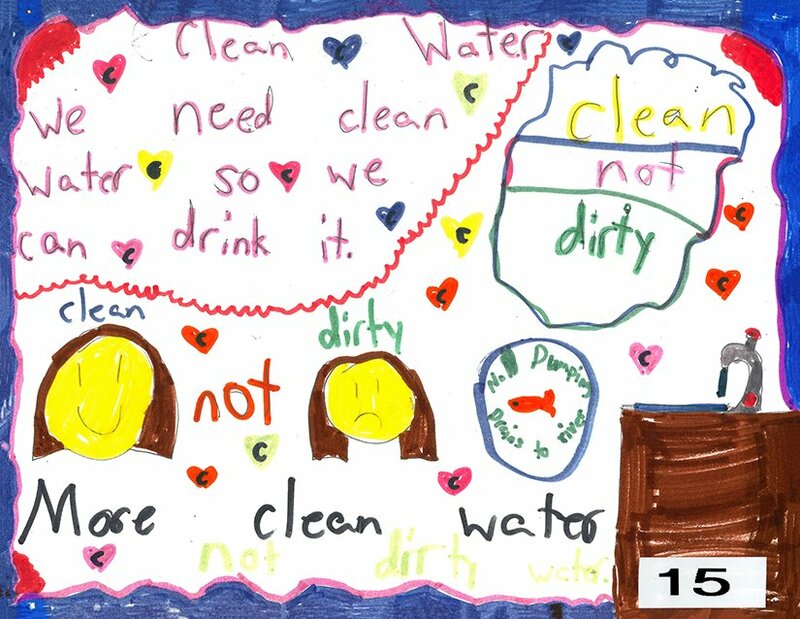 Congratulations to Brandy Kilpatrick, a 5 year old from New Philadelphia, who won a season pass to the Tuscora Park swimming pool by being selected from 12 other applicants for the First Town Days poster contest to educate the community about the prevention of storm water pollution. Her clever take on the popular “Poo” emoji won the hearts of First Town Days Festival attendees. 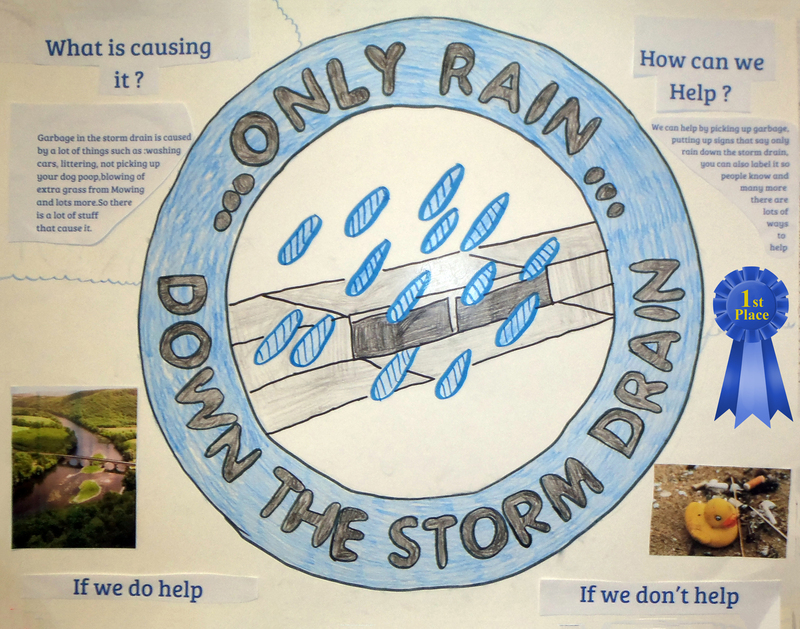 Visit the Storm Water section on our website to learn more on how you can help in eliminating surface run-off pollution.